The monitoring of biodiversity is in increasing demand in the international development sector, as the key role of biodiversity in securing livelihoods through the provision of basic goods and ecosystem services is more and more acknowledged. Many professionals working towards sustainable management of natural resources and nature conservation are confronted with the task of biodiversity monitoring yet have a background distant from biodiversity sciences. The internet offers an overwhelming amount of information, filtering and gleaning which can be a time-consuming way of getting a grip of the topic. 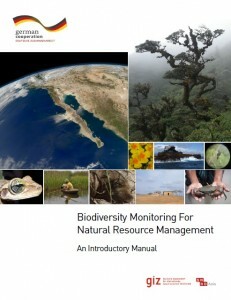 A new manual titled “Biodiversity Monitoring for Natural Resource Management ― An Introductory Manual” addresses this issue and provides succinct practical guidance for planning biodiversity monitoring. It addresses some of the principal questions, issues and pit-falls in biodiversity monitoring, and offers selected references and download links to further reading.